Here is my imponderable question of the day. Why is that when you purchase a fitness DVD to do at home, the picture on the cover always features a person who looks like this? Is this picture supposed to somehow inspire me? Is it supposed to make me feel energized? Is it supposed to engender feelings of warmth and happiness? Hmmmm? WHAT is the purpose of that kind of photo? And let me also ask you this imponderable question? Why is it that the workout included on the DVD unfailingly features a whole flock of other annoyingly thin ladies--in addition to Miss Twiggy on the cover? Just how is that supposed to make me feel motivated? Why don't they put real people on the covers? Why don't they put real people in the demonstration? Real people like the model on this magazine cover? There now. Don't you all feel better? Don't you feel inspired? Can you see how the inspiration just oozes out of the model's face? Do you see how she is trying to burn into your brain the irrefutable truth that even the food you eat standing up contains calories? And even if you break a cookie in half before eating it, the fat grams don't fall out? And that consuming your child's leftover macaroni and cheese so it doesn't go to waste will still, um, make the macaroni go to "waist?" These are the kinds of truths that the perfectly formed women on the covers of exercise DVDs are not capable of communicating. And that is why I believe that I may have a second career in being a fitness magazine model. 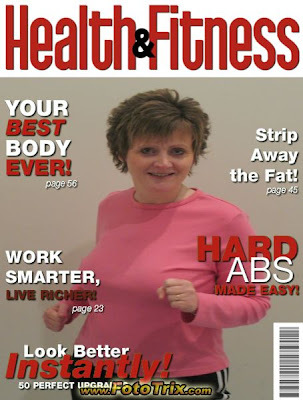 In fact, I'm quite certain that as soon as this magazine cover hits the Internet, my phone will be ringing with Fitness Modeling Offers. And if, for some odd reason, they don't think the picture on this particular cover is what they're looking for, I have more! My own personal fashion/fitness photographer, the famous Sarah Smith, also took these photos last night. I know beyond any doubt that you can not look at these photos and not be inspired to lose weight! And that knowledge makes me so very happy. I am inspiring people around the world to eat healthy and get fit. My fluffy (but happy) form on the front of fitness magazines may very well begin a revolution in the weight loss world. It's a, um, heavy responsibility. You should get the Biggest Loser videos! They have real people doing the exercises and it is fun!! I have the Cardio Max video and love it! Ok a 30 day break from deserts (no chocolate) how much weight did you lose? Another thing....why are the models who promote the age defying, wrinkle reducing, botox replacing makeup are not old enough to even know WHAT A WRINKLE LOOKS LIKE - they have beautiful skin to begin with - now, put ME on one of those ads and see if that wonder of wonders lifting, plumping, smoothing, age reducing makeup works - I don't think so!!! Besides, it would be very scary and no one would take more than one glance and then run screaming. By the way, Becky - you look pretty darn fit to me!!! Also, why do microwave dinners never, ever look like the picture on the box? They look like they have been steamed, squashed and sometimes already chewed when you tear back, ever so carefully, that plastic film. Trust me, you are ANYTHING but heavy! They'd have to do a two-page spread to get all of me in there! I'm the 'before' to your 'after' pic! You're looking pretty good in your workout clothes. I wouldn't be surprised to see you on a magazine cover really soon! Um, lose weight? Why? You're a slim gal already! I always enjoy reading your blog, by the way. Oh I love your poses for eating healthy and getting fit! Keep inspiring...I may have to do 30 days without a soda! I LOVE Sweating to the Oldies. Becky you look fine!! You look great, and you look wonderfull. Just the way you are!!! I was just crying my eyes out after a really rough day when I read your post- thanks for cheering me up and bringing a smile to my face. The good news is that Leslie Sansone is a wonderful, Christian instructor and her DVDs are easy to follow. She even has one with Christian music. I am, at this very moment, going to do my exercise with Leslie since I didn't get to the gym today. No sweets for 30 days ... and you lived to blog about it! So proud of you. :) You're looking great, Becky! So what lucky dessert was chosen on day #30?? ?